In the past several years, ambitious and talented programmers and hackers have made some substantial improvements to some classic DOS games. Here in this blog entry I will highlight some of the hacks I consider to be the most impressive or most useful. I am particularly interested when elements of a game, such as unique sound effects, that could have been experienced at the time of the game's release in a less than ideal way have been added to the DOS versions of these games. This is not intended to be a comprehensive list of every hack out there. I am not including simple speed fixes or DOSBox compatibility patches. I also am not including any hack which I feel violates the "spirit" of the original DOS code. Some of these hacks are more involved than others, but I wanted to give an overview of what kind of hacks are out there. Some of these hacks are nearly 10 years old, but all were given to an organized community of vintage computer and DOS gaming enthusiasts. About ten years ago I found myself in need of a hardware MIDI solution for my Windows XP machine. At the time I had a Sound Blaster X-Fi in the machine, but it did not have a hardware MIDI IN and OUT port. The add-on that would add these ports was very expensive at the time, but I needed a hardware MIDI solution to use my Roland MIDI modules such as the CM-500 I had at the time. A less expensive solution was a USB MIDI interface, so I decided to buy one. The one I bought was the Edirol/Roland UM-1X, and it was not particularly inexpensive but I figured I needed a good quality solution for non-GM devices like the MT-32. The UM-1SX is the same interface as the UM-1X but you need to plug in your own MIDI 5-pin cables. There were earlier UM-1 and UM-1S, which appear to function identically to the UM-1X and UM-1SX except they do not have the Advanced Driver Switch on them. After the UM-1X is the UM-1EX, which adds a switch for toggling MIDI OUT and MIDI THRU functionality and the UM-2EX, which adds a second MIDI OUT. After the 1EX and 2EX came the UM-ONE and the Roland UM-ONE mk2. The UM-ONE mk2 is the only one of these products which is not discontinued. The ONE and the ONE mk2 are the only one of these interfaces that have Windows 10 drivers. The rest have drivers only until Windows 8/8.1. Microsoft Windows 3.0 was the first widely adopted and truly successful version of Microsoft's graphical "Operating System." It was released on May 20, 1990 and came on five 1.2MB floppy disks. It could be purchased in a box and was the first version of Windows that was noted for being bundled with new PCs. 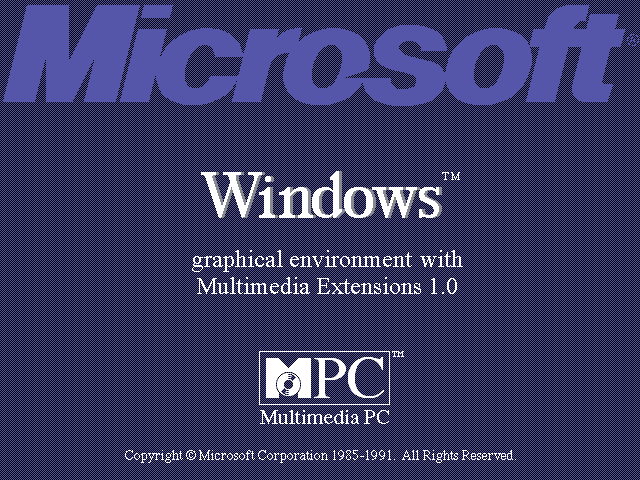 It had an incremental update, Windows 3.0a, released on October 31, 1990. A rotary encoder is a wheel that sends positional information as it is moved. The rotor or disk looks like a wheel with spokes and holes. The wheel is attached to a shaft which is moved. The movement can be tracked electromechanically or optically. Electromechanical rotary encoders send information as an electrical circuit is made and broken by movement of the rotor. Optical rotary encoders send information as the spokes and holes of optical transmitter/receiver allow and break an infrared beam. A rotary encoder can be found at the heart of several input devices, namely spinners, mice and trackballs. The earliest arcade spinners, such as those found on Pong and Breakout, were just knobs stuck on the shaft of a potentiometer. Movement would typically be calculated by measuring the charge or discharge time of a resistance/capacitive circuit. These knobs could be moved in either direction to a stopping point, they could not perform a full 360 degree rotation. On Friday, I sat down at my 486DX2/66 computer and decided to play a little King's Quest VI: Heir Today, Gone Tommorow. KQ6 is definitely one of Sierra's best games and it had been a long time since I last tried to play it through. I had the floppy version installed on my hard drive, so I started up the floppy version. Unfortunately, it took the whole weekend to track down the problem and implement a solution for it.